Shinco, brand of Videotex, has launched 4K Ultra HD SMART LED TV’s – S43QHDR10, S50QHDR10, and S55QHDR10 in India with screen sizes of 43, 49 and 55 inches, respectively. 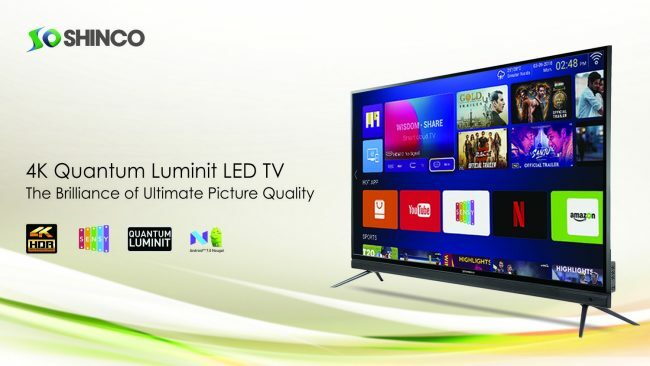 These TVs boast of Quantum Luminit display which is fused with a Wide Color Gamut that supports 95% NTSC and the HDR10. The 43, 49 and 55 inches screen configurations TVs are priced Rs. 26990, 29990 and 36990, respectively. These TVs are empowered with AI powered by SENSY. The Sensy TV guide Application installed in the Shinco Tv’s allows you to create a wall of moments as you view content from your Set-top box. From recently watched to upcoming movies, your TV shows to your scintillating music, everything comes on your Smart TV, allowing you to operate your TV with just your TV remote, by fixing the detachable Sensy IR Cable, which comes along with the TV. The TV also has Voice Recognition feature that allows the users to command the TV via the Sensy App installed on the user’s smartphone. It also comes with an “Air Click Remote” designed with a QWERTY Keyboard, which allows seamless operations possibly from any corner of the room. Shinco TV model S43QHDR10 comes with Box Speakers and the Models S50QHDR10 and S55QHDR10 offer a Built-in Sound Bar powered with Boosted Tweeters for enhanced audio output. These TVs come with 1 GB RAM and 8 GB ROM. These TVs run on Android 7.0 Nougat. Shinco is claimed to have a network of more than 800+ service centres PAN India. The ‘Shinco’ app is available on Google Play Store allowing you to drop-in a request for installation/repair of your device or register your product online. The app also helps you find a service centre near you and contact an agent for fast repair turn-around.